Let’s Work Together to Build Your Dream Deck! 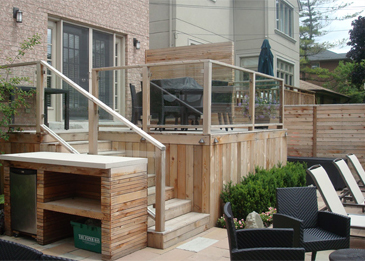 Installing a new deck or upgrading/rebuilding your current deck is a popular renovation project among Toronto homeowners. An increasing number of people want to create an outdoor oasis and maximize the space they have in their yard. While space can be limited in downtown Toronto or old Toronto, The Deck Builders can help you maximize your outdoor space by building a deck that checks off everything on your must have list. As experienced experts specializing in deck design and building, we are always up for a challenge to build something unique. Building decks in Toronto can be a challenge. With so many unique properties, yard layouts, and neighborhoods, we approach each deck building project with a clean slate. 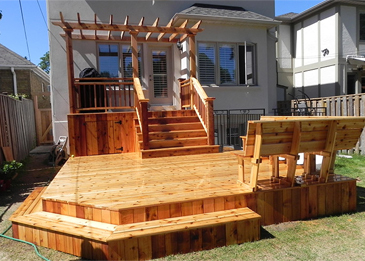 We build multi-level decks, roof top decks and pool decks or a simple walk out deck. You can be assured that we will work with you to accomplish the best work possible. We’re happy to talk with you about your design options to ensure you choose the right materials, get the design elements you want, and maximize your investment, regardless of the unique space we are working with. Why Build A Deck For Your Toronto Home? 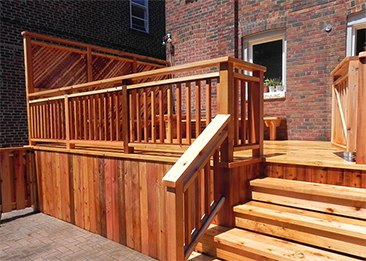 Whether you want to build a deck in Toronto, downtown Toronto, old Toronto or any other area in the city, our team can work with your available space and help you create a beautiful deck that has the design and functionality you want to achieve.